I'd like to start a game of correspondence chess. Would anyone like to join me? For those who haven't done it, it's pretty basic. One just uses algebraic chess notation to make a move, then one's opponent will respond in kind. I figure we can do that in our seperate posts to this thread, although if many games get going we might want to either split off threads or mention at the beginning to whom we are responding so lurkers can keep the participants straight. The following is algebraic chess notation 101, so anyone who already knows it can skip the rest of this message. I just want to make sure that anybody who doesn't know how to play has the tools. Algebraic chess notation involves letter symbols for pieces. In the case of all of these pieces, their moves are designated by their piece letter first, then the square onto which they have moved (e.g. Nf3). "e" represents the file (vertical column) and 4 represents the rank (horizontal row). Black's response is given starting with an ellipsis and then the algebraic notation for the move. E.g. Captures are designated with an x between the piece and the square on which the capture is being made. For example, a knight capturing a piece on the sixth rank in the b file would be Nxb6. The symbol for check is + and ++ for double check, written after the move or capture (e.g. Qh4+ or Qxh4+ or Re8++, and so on). 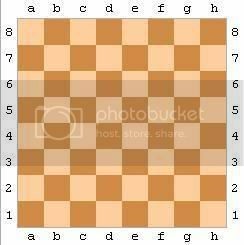 Checkmate is written with a # after the algebraic notation for the move, although some older books use ++ for checkmate. If there's any potential ambiguity about which one of two potential knights or rooks (the two given bishops cannot cross each other's paths) has moved to a square, then the algebraic notation starts with the piece's identification (say, N), the rank on which the piece was ("d") and the specific square to which it moved (f5) for a combined Ndf5. Castling is denoted by 0-0 if it's to the kingside, and 0-0-0 if it's to the queenside for both players. If you're lucky enough to have your pawn reach your opponent's back rank (1 for white, 8 for black), then it will be promoted. FIDE (Fédération Internationale des Échecs) standards give the piece chosen after the move made, like this: e1Q, f8R, etc. That's about it for algebraic chess notation. Last edited by Nullifidian; 01-12-2008 at 01:07 AM. Hypothetically, if you have a pair of nights on, say, d2 and d4, and you move one of them to f3, do you write Nd2f3? In that case, the disambiguation would use the rank rather than the file. In this example, it would be N2f3. It doesn't happen very often. You can use both the rank and file indications if neither of them alone uniquely defines the piece, but I've only seen that happen after a pawn promotion. Last edited by Nullifidian; 01-12-2008 at 01:06 AM. One thing I didn't cover above was capturing en passant (in passing). Since a pawn can move two squares initially from its position on the front rank, this creates a situation where the pawn can entirely bypass a threat from a neighbouring enemy pawn sitting in the fourth or fifth rank. Note that an abbreviation is not used; it is treated just as if the capture had been made on square c3, but the notation for white's pawn makes it clear that it's a capture en passant. Sometimes e.p. is used in some books, but that's an abbreviation which is not standard under FIDE rules. So, who will play White? Pan Narrans and I are in chat right now, and we've agreed that he will play as white, since he's playing without a chessboard right now. If you want to post pics of the game to make it easier for us observers, here's one site. The sensible choice, though I was hoping for 4. Ng5.